Pakistan police officer ranks, badges with grades/ pay scales and all other detail is given here. SHO, DPO, CPO, RPO and PPO are posts not ranks. So you may see a lower rank acting as a higher post for some time. Station House Officer (SHO) could be either a Sub Inspector or Inspector. Deputy Superintendent of Police (D.S.P) and Assistant Superintendent of Police (A.S.P) are of same level, the difference is that DSP is promoted from junior rank and is an experienced Police officer while ASP is a young Police officer who joined the service directly as an officer after passing civil service exam. All provinces of Pakistan have their own police service such as the Punjab Police, Khyber Pakhtunkhwa Police, Sindh Police, Balochistan Police. Azad Jammu and Kashmir (AJK) Police, Islamabad Capital Territory (ICT) Police and Gilgit Baltistan (GB) Police works in their territories. 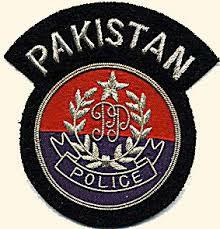 Each police force has a Commissioner of Police appointed as Inspector-General who are the most senior officers from the Police Service of Pakistan (PSP) - a constituent of the Central Superior Services of Pakistan. There are several other types of law enforcement agencies e.g. Airports Security Force, Anti-Narcotics Force, Federal Investigation Agency, Frontier Constabulary, National Highways and Motorway Police, Pakistan Coast Guard, Pakistan Railways Police, Pakistan Customs, Balochistan Constabulary, Balochistan Levies, Frontier Police, Punjab Prisons, Police Qaumi Razakars, Frontier Corps etc.